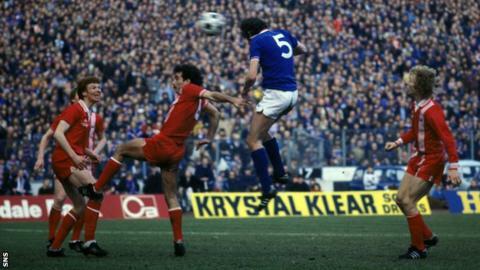 Rangers have announced the passing of former defender Colin Jackson, who has died of cancer at the age of 68. Jackson made over 500 appearances for the Ibrox club between 1963 and 1982. He was also on the books of Morton and Partick Thistle and won eight Scotland caps, scoring one international goal. "I am devastated by the news that he has passed away, I have lost a great friend and my thoughts are with his family at this very difficult time," said former team-mate John Greig. The Rangers Hall of Fame member failed a fitness test on the eve of the 1972 European Cup Winner's Cup final win against Dynamo Moscow in Barcelona. But he did win three league titles, three Scottish Cups and five League Cups during his time at Ibrox. Rangers chairman Dave King told the official Rangers website: "On behalf of everyone at Rangers Football Club I would like to send my sincere condolences to Colin's family and friends at this very sad time. "Colin will be sadly missed by everyone who knew him."